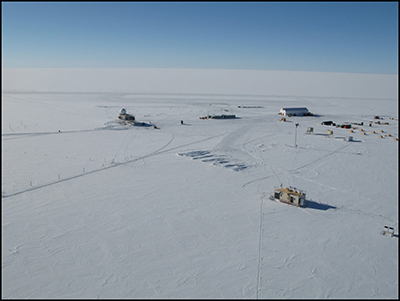 Summit Station, in the center of the Greenland ice sheet, is a vibrant interdisciplinary research hub that has served as a crucial component of the Arctic observing system for nearly 3 decades. This station has yielded numerous scientific insights, but operating Summit and similar remote stations is resource intensive. Keeping these stations at the cutting edge of scientific research requires strategic planning and scientific vision. Summit remains the only site on the Greenland ice sheet with a long enough history of measurements to understand and model current changes and place them in a broader context. Earlier this year, the National Science Foundation supported and hosted a planning session to update the scientific vision and direction for Summit Station. A multidisciplinary group of about 30 scientists, including remote participants, reviewed science activities at Summit, defined future scientific research questions and goals, and made community-based recommendations on science-enabling future scenarios and governance. A full report can be found on the GeoSummit website. Participants emphasized that Summit’s high-latitude, high-altitude site, which is largely free of environmental pollutants and other local human influences, serves as a flagship for process-based scientific discovery. Scientific inquiries address questions ranging from the outer reaches of space to the bedrock below the Greenland ice sheet and all points in between. The group also emphasized that Summit remains the only site on the Greenland ice sheet with a long enough history of climatologic, atmospheric, and glaciological measurements to understand and model current changes and place them in a broader context. They concurred on the importance of encouraging funding agencies to recognize how vitally important the climate length records collected at Summit are to a broad swath of the scientific research and modeling communities. Summit leverages a suite of scientific measurements, allowing researchers to go beyond their own study and put their research into the larger climate perspective. For the future, participants outlined the station’s effects on science under various logistics and operating scenarios, which included very sparse operations of the station, year-round personnel and/or power, and fully robotic operations. They recommended logistics scenarios that maintained year-round measurements to study processes that directly relate to improving atmospheric, climate, and ice sheet models; calibrating satellites; and determining long-term trends and variability for studying key scientific processes. Other recommendations included expanding Summit Station for future astrophysics studies. The group emphasized the importance of maintaining a clean snow and air sector under any expansion scenario. They outlined a future vision of automated and robotic measurements, and they encouraged continued efforts to collect and publicly disseminate Summit data sets broadly and efficiently. Citation: Koenig, L., B. Vaughn, and J. Dibb (2017), Envisioning and sustaining science at Summit Station, Greenland, Eos, 98, https://doi.org/10.1029/2017EO082095. Published on 18 September 2017.